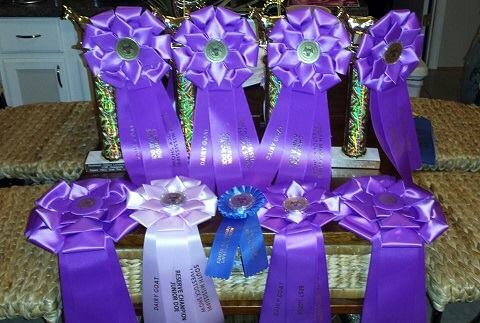 In order to advance to Dixie National Rodeo and Livestock Junior Roundup (Mississippi’s State 4H show), you must compete in the County and District shows and receive a Blue Ribbon. If you receive a Red ribbon, then your animal cannot proceed to the next show. The ribbons are less about placement and more about normality. Very few red ribbons are given out as the reasons they are given are because of birth defects or other problems with the animal such as a sick goat, one that is lame, or some other visible defect. This is the story of the District show. At the district show we were required to check our goats in the day before the show on Friday, so we got there early and settled in for the night, all was well. The weather was good considering it is winter time here in Mississippi. Saturday morning was like any other show,everyone buzzing about touching up their goats getting them ready to show. We usually have most of ours ready well before show and just give little touch ups, Saturday wasn’t any different. So that morning we started walking our does over to the show barn to move them into the show pens closer to the arena. All the does walked just fine except Monica, she froze! I mean dead in her tracks, she would not move. Jenny tried, Jess tried and I tried, all with much patience and coaxing. However she was scared. Why? Because of all the blowers people were using to dry off their goats and blow hair away. At this point it was either drag her or pick her up and carry her. The less stress option for her was to pick her up and start moving. So I did. I picked her up and carried her away from the noises that were making her frightened and then she did just fine. The day went quite well once in the show barn. First they started off with the Showmanship classes as always. Jessica did not have any competition in her age group for the Showmanship so she picked up First Place. The judge as always, made great comments about her, said she knows her goats and all about them and that he could tell she did the caring for them, which is what 4H is all about. The judge said she could do with some competition. She will have plenty of it at the Dixie Show. So then we moved into the showing of the goats! I’m going to make this simple. We did not have any competition in the same breeds (Alpine, Nubian) other than our own goats competing against each other, however for the other breeds we did and they were quite nice goats too. 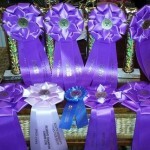 The show went really great and the girls won lots of trophies and rosettes. Skipping over the breed classes, we’ll move right into the Best in Show Junior and Senior Doe. Sweet Chariot Marlena Best in Show Sr Doe ! Sweet Chariot Monica Best in Show Jr Doe ! We were so proud and happy. The coolest thing about that is…Marlena is Monica’s Dam (mom). So how about that, Mother and Daughter go to show together and win it together! We’re off to get ready for Dixie this coming week to finish of our round of 4H shows this season. If you’re not already following us at our Facebook page, please stop on by and give us a like! Then stop on by our Camelot Hills YouTube Channel where we show plenty of videos on goats and the things we do around the farm.